I thought about ending this photograph’s title with a question mark to convey the right inflection to reflect my second guessing as where to shoot yesterday. After Friday’s snow I was back to my regularly scheduled sunset shooting on Saturday. Initially I was going to head to Great Bay Boulevard, but idling at the intersection of Nautilus and Route 72 I had a change of heart. Perhaps not up for the longer drive due to hunger I tossed the plan and made for Surf City’s Sunset Park. While this spot seldom disappoints I knew I was taking a bit of a gamble. Over the winter months, as well as the tail end of fall and early spring, with the sun setting at a more southwest orientation it’s sometimes difficult to make a good angle from this purely westward facing spot. For that reason I abandoned bringing the sun disk into the frame. Relying on theater of the mind the sun can be envisioned off screen quite far to the left of my frame. This all worked out, however, with soft wisps of clouds coloring up nicely over the lightly rolling three inch waves lapping the sand and pebbles just on shore. 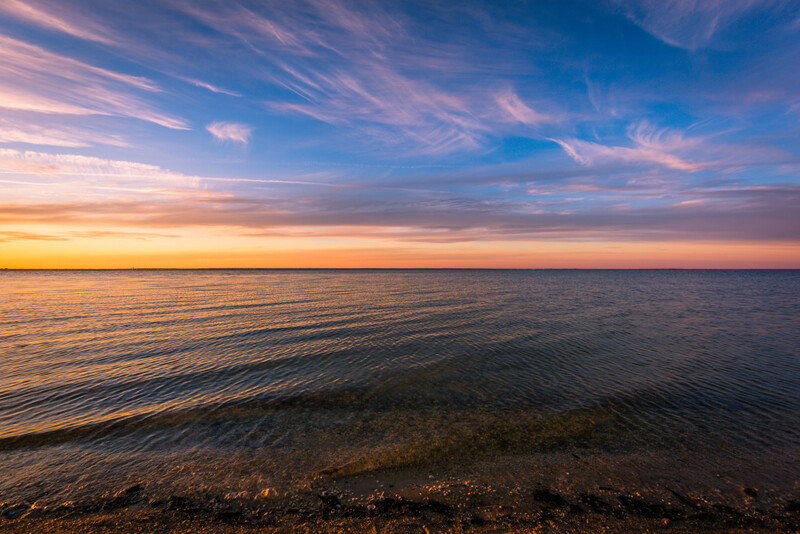 It was a peaceful seen along Barnegat Bay, and several revelers made it to the shoreline to say goodbye to the day. At least three or four folks with their cameras, and what looked to be a gentleman tucked away in the northwest corner possibly making a time lapse. It’s always nice to see others making the most of the sunset muse. Yet with that my focus shifts back to the upcoming snow potential across the mid-Atlantic over the next 72 hours; because where there’s snow potential, there’s photo potential.